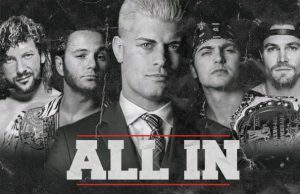 It all started Friday night at the Global Force Wrestling show in Pennsylvania, Kevin Nash got on the mic and officially passed the torch to Doc Gallows and the Bullet Club. The footage you see above was shot by Title Match Wrestling last night in Richmond, VA. Doc Gallows was wrestling Sanada and Ali Akbar in a handicap match, when Kevin Nash came to the rescue! After dispatching of Sanada on the outside, Jeff Jarrett also got involved – leaving Doc Gallows to get the pin on Ali Akbar. How cool is it that the NWO has officially backed the Bullet Club? Too sweet!